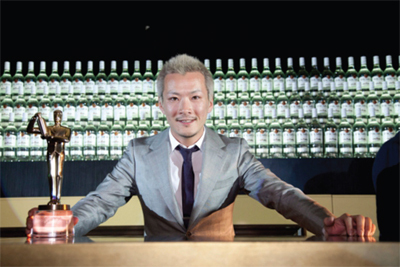 New York City bartender Shingo Gokan has won the second Bacardi Global Legacy Cocktail Competition (BGLCC). 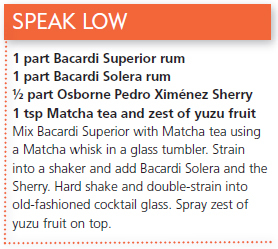 Gokan’s winning drink, called “Speak Low”, was judged alongside seven other finalists from around the world at the contest final, held at the Bacardi distillery near San Juan, Puerto Rico. The eight finalists were selected from 26 who were on the island for a week to learn more about the Bacardi brand and train with highly ranked mixologists. Gokan, the final competitor on the night, took inspiration from his Japanese heritage and based his drink on his grandmother’s tea ceremony in both presentation and flavour. He completed his drink with 15 seconds left of his allotted 10 minutes. “It was everything about Shingo – the simplicity of the drink, his abilities behind the bar and his emotional connection with the audience – he made us all cry,” explained Bacardi global brand ambassador David Cordoba. The competition, which is part of the Bacardi 150th anniversary celebrations, was judged by an international panel, including two Bacardi Maestros de Ron: Jose Sanchez Gavito and Luis Plane, as well as Cordoba, “Ambassador of Aloha” Stanislav Vdrna, and 2011 BGLCC winner, Marc Bonneton from France. As part of his prize, Gokan will visit the Bacardi distillery in Mexico and travel to five countries to present his drink.